Banalities are never in short supply when one tries to discuss the popular uprisings of the past: "revolutions devour their own children", "violence begets violence", "absolute power corrupts absolutely" - such platitudes are often all people feel the need to say about events that have had enough books written about them to fill up a library. When they take place in a Middle-Eastern country, the racist idea that Muslims, left to their own devices, can only replace a pro-Western dictatorial regime with an even worse, Islamic regime, is all the more tempting to those whose understanding of the region has been heavily colored by post-9/11 Islamophobia. This is the attitude many people take towards the 1979 Iranian Revolution, but no one was quite so blase about it when it was taking place, and for a good reason. The revolution signaled the last days of the Baghdad Pact, and was taking place at the same time as the Muslim Brotherhood uprising in Syria, The Soviet-Afghani war, the Lebanese civil war and Israeli invasion of the country* - all over Asia and beyond it, the status-quo established in the decades after WWII was threatened, and both the West and the Soviet bloc were intervening aggressively in an attempt to keep their client regimes in place. The Iranian Shah wasn't just a reliable supplier of oil - he was a symbol of stability in a sea of uprisings. His regime's demise was a political defeat as much as it was an economic one, and its reverberations can be felt to this day. 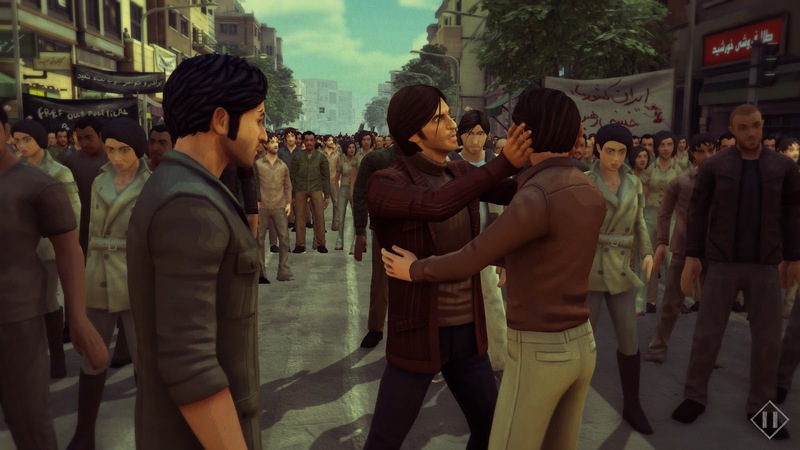 With such heavy subject matter to tackle, 1979 Revolution: Black Friday's triumph in interactive storytelling is all the more significant. 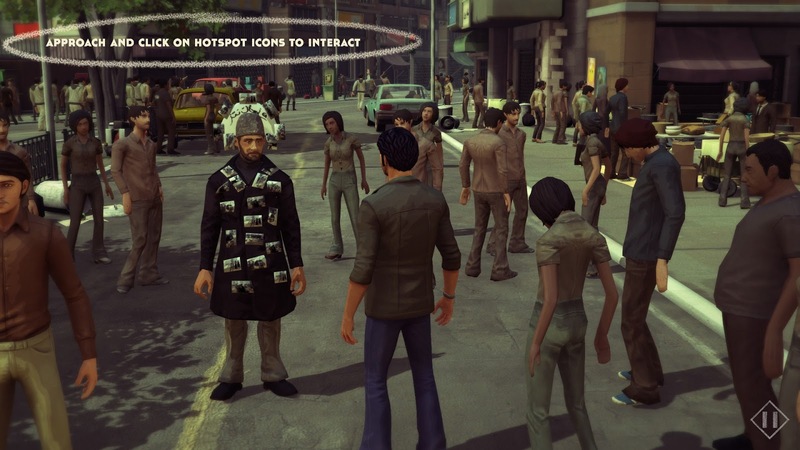 By having the player character take an active role in the revolution as well as exposing players to its social, cultural and political backdrop, it can be said with no hyperbole that it has won an important place in video game history. The story is told from the perspective of Reza Shirazi, a photographer who came back to the country after studying in Germany. After some obligatory cliches - Reza says that he is just there to take photos, and is of course told that he will eventually have to pick a side, even though that never actually happens - and some rather cringe-inducing references to his friend's "legendary disco moves", we are given the opportunity to take photos of the revolutionary crowds. 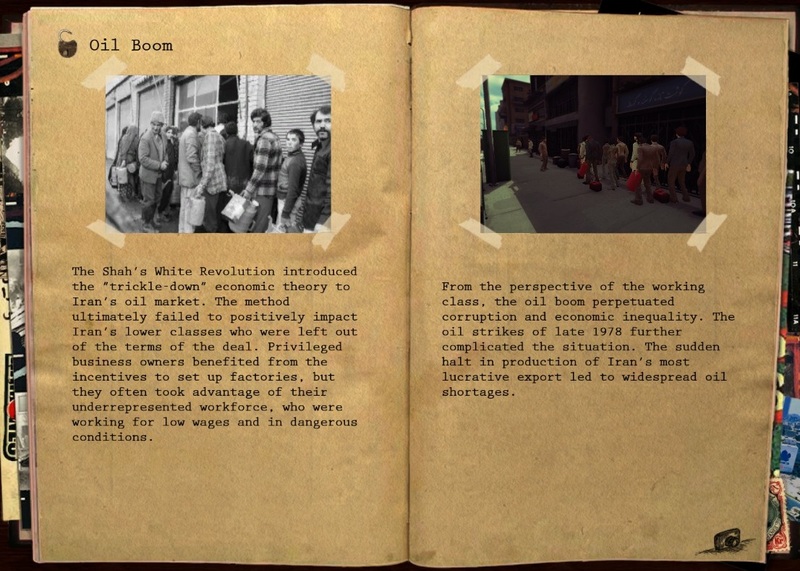 Taking pictures is an important part of the game, both as an immersion device as well as a way to teach us about the revolution - each picture taken offers the possibility to read more about Iran and the revolution, complete with real-life photographs and audio. But this is a revolution, and idle exploration cannot last forever. Other than very few QTE sections, which are about as exciting here as they tend to be in any other game, gameplay outside of the exploration sections involves making dialogue choices. 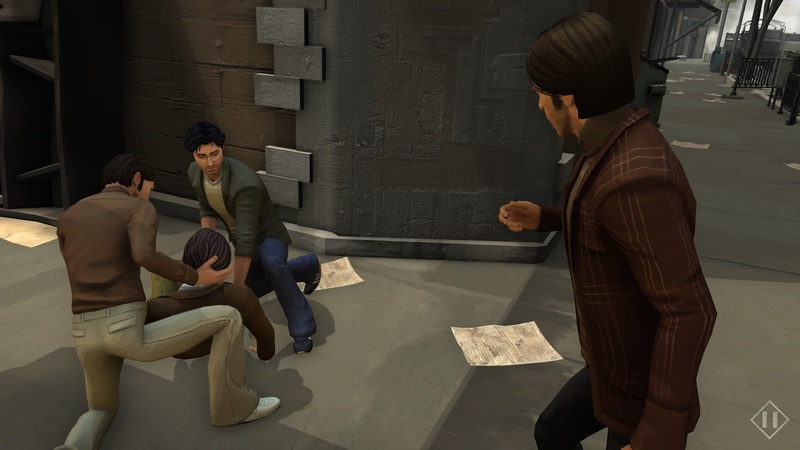 This is where the game's storytelling strengths really made an impression on me early on: one of the first decisions you have to make is to choose a side in an argument between two of your friends, and the choice is given in the form "Side with Babak" or "Side with Ali". At first I panicked, because I'm used to being made to pick a character's side before I even knew their names - but I realized very quickly that I had no such problem in this instance. 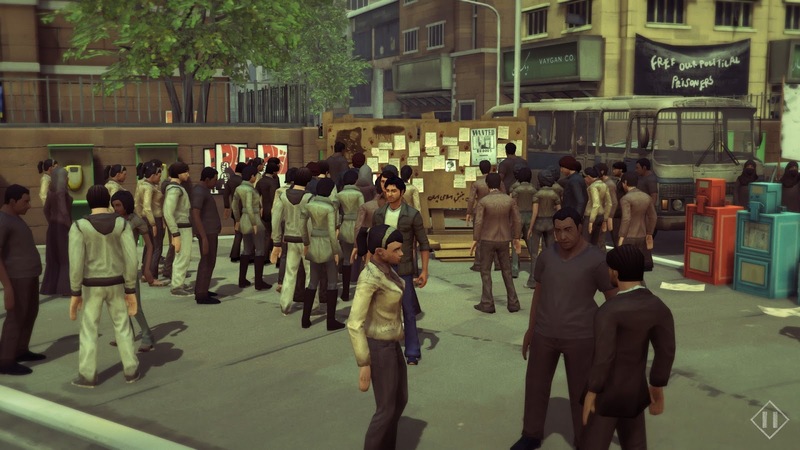 It may seem like a small thing, but the fact that few games - and indeed, stories in general - make their characters recognizable this early on makes 1979 Revolution's character-building stick out even more from the crowd of story-based games. 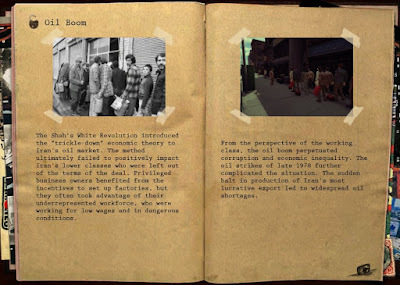 At this point you might suspect that 1979 Revolution's developers took some inspiration from Telltale, and you would be generous: the thing is a complete and utter rip-off. In a game so clearly modeled after Telltale's games, to the point of telling you that a character "won't forget" a choice you've made, perhaps having a rather important secondary character called "The Walking Dead" is a bit much. But plagiarism, when done so well, is easily forgiven. The game's story is masterfully paced, transitioning seamlessly between the excitement and noise of revolutionary gatherings to quieter, reflective sections where Reza and his friends discuss their ideals, deal with inter-factional intrigue, and even a look at Reza's family life and the tough balancing act between loyalty to one's ideals on the one hand, and loyalty to parents and siblings on the other. Many a middle-class youth turned political activist can attest to a similar conflict, though few will ever face the sort of brutal repression meted out to the Iranian protesters. 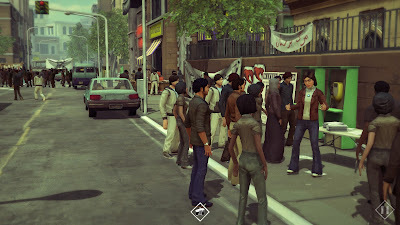 1979 Revolution has a fascinating story, but that's not where its significance lies: its true importance lies in how it works as a specifically video-game narrative, where active identification with the protagonist's motives is vital - as opposed to more passive media such as films and books, where understanding and sympathy can be enough to maintain one's interest. However, it should be noted that the game is hardly a technical tour-de-force. This should not harm one's enjoyment of the game; if anything, the fact that the technical issues present are barely felt after the very first sections is a testament to the game's strengths. However, it should be noted that janky controls, frame-rate drops and re-used character models abound, never enough to make the game unplayable and certainly never enough to harm one's enjoyment of it, but enough to be felt. However, the game does have its fair share of more significant problems, and these go beyond technical issues. In fact, most of these are perfectly captured in the introductory interrogation scene. 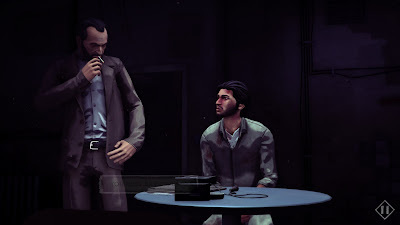 The interrogator, Assadollah Lajaverdi - who is based on the real-life, notorious warden of Evin Prison - tells Reza that he knows that he joined the revolution upon returning from Germany, an exposition dump which is completely unnecessary to the conversation and is said only for our benefit. Another line that I found puzzling is when Lajaverdi says that Reza committed crimes "against Islamic republic of Iran". Since Farsi has no definite article, it makes perfect sense that an Iranian who may not be very fluent in English will omit a "the" every now and then. However, since the conversation takes place between Lajaverdi and Reza in Iran, there's no reason for them to be speaking in English, so there's no reason why we shouldn't have a correct translation here. It's a nitpick, but it's the sort of small detail that makes or breaks believable dialogue. It is also unfortunate that a game that in general does such a good job at establishing a video-game narrative misses the opportunity to have us experience Reza's suffering in a more meaningful way, especially when this has been done in games in the past. When you are jailed in Skyrim, escape seems impossible, and the game does a lot to convince you that your character might really be stuck in prison forever. Metal Gear Solid, one of the finest examples of a video-game narrative, puts you through actual physical pain during a torture scene that feeds into the feeling of oppressive isolation in your jail cell. 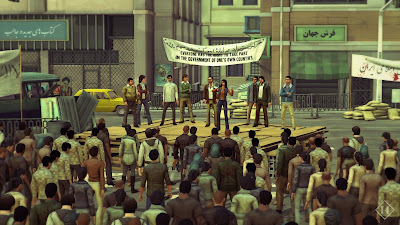 It's too bad that 1979 Revolution's developers could not come up with an equally creative way of driving home the horrors of imprisonment. These criticisms may seem petty, but the small weaknesses are only so glaring because of how well everything else works. Where video games before would usually deal with history with either the vulgarity of Company of Heroes or the shallowness of Assassin's Creed, here we have a game that takes a critical, analytical and well-balanced approach, without the false pretense of being objective. 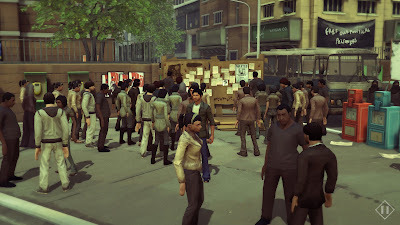 The game is clearly anti-Shah and pro-revolution, but it mostly lets the different factions speak for themselves, even if the portrayal of all Tudeh party members in the game as violent, hot-headed thugs betrays a certain bias. Most importantly, the game deals with an issue that's rarely talked about when it comes to revolutions in the Middle-East - the central role of women. The most important character in this regard is Bibi, a leader who, at one point, breaks up an argument between supporters of Tudeh, the National Front and the Mujahideen, telling them that they need to remain united despite their differences. Whatever you think about the political point, the fact that members of all three factions treat her with respect is a break from the myth that people in the Middle-East - especially Muslims - will not accept a woman as an equal, let alone as an authority figure. The 1979 Revolution had a tragic end, and the game does not shy away from that fact. But it also shows us what could have been, and what could be in the future. For this reason and many others, 1979 Revolution: Black Friday is a game that anyone with even a passing interest in human history or interactive story-telling should experience. * These examples were chosen quite at random, and yet it's sad to see how much the state of the region today resembles the landscape of 1979. ** One interesting part discusses how anti-Shah speeches were recorded on cassette tapes and smuggled into the country to rally the people to the revolution. It's not hard to imagine smug Western commentators at the time using this fact to show that Western technology was the catalyst behind the revolution, much like they did with Facebook and Twitter during the so-called "Arab Spring".